The THRIVE Experience is an 8-week premium lifestyle plan to help individuals experience and reach peak physical & mental levels. You're going to live, look, and feel Ultra Premium like never before! Results from the THRIVE Experience are high impact, and can differ slightly from person to person, depending on your 8-week goal, and which areas of your lifestyle need the most help. 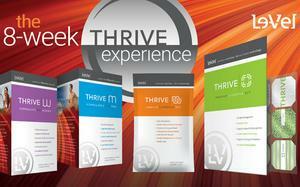 Whether your goal is to lose weight, get in the best shape of your life, or simply be the best you can be, we know the 8-Week THRIVE Experience will get you THRIVIN' in all areas of your life! Individuals on the Experience will enjoy premium support and benefits in the areas of: > Weight Management+ > Cognitive Performance+ > Digestive & Immune Support+ > Healthy Joint Function+ > Lean Muscle Support+ > Calming of General Discomfort+ > Age-Defying & Antioxidant Support+ THRIVE by Le-Vel is something that's hard to explain, and challenging to describe... it's something that can only be experienced.